Google is taking a step towards taking all the messy, unstructured information on the Web and putting it into neat little, labeled boxes. Literally, that is what Google Squared does. First announced at last month’s Searchology event, Google Squared is now live. You can try it out. Google Squared is an experimental search engine that is in its own “labs.” It gives you topical search results broken down by categories, something that Bing does in a different way with guided results in the left explore pane. Google Squared is more comparable to Wolfram Alpha in that it is A) really early stage, and B) goes and finds out every facet of a subject based on a single keyword search. But unlike Wolfram Alpha, it does not “compute” answers based on data that it has ingested into its own databases. Its database is the Web. 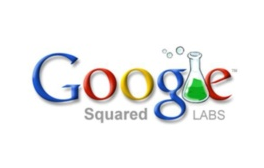 Does Google Squared crush Wolfram Alpha today? No. But as I originally suggested when it was announced, adding structure to the Web will eventually win out over a self-contained database. Even if it seems primitive today, its approach scales better than Wolfram’s. 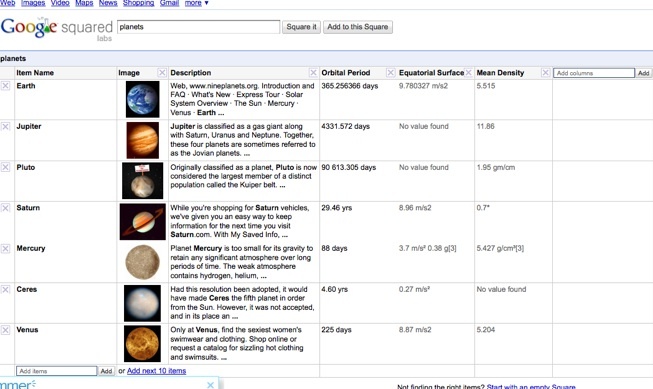 Type in something like “planets” and the results come up as grid with the planet names, images, a short description, the equatorial surface, and the mean density. It only manages to identify seven planets, and those include Pluto and Ceres. (Where’s Uranus?) This is still very experimental. But you can add more rows and columns. When you click on the the “add” box under the planet names, for instance,, it will suggest the missing ones. Or you can add yor own category, and then it will fill in the other boxes in that row. You can also add a column. It suggests categories such as “Date of Discovery” and “Escape velocity” (which is important to know if you are planning to visit and want to ever return).